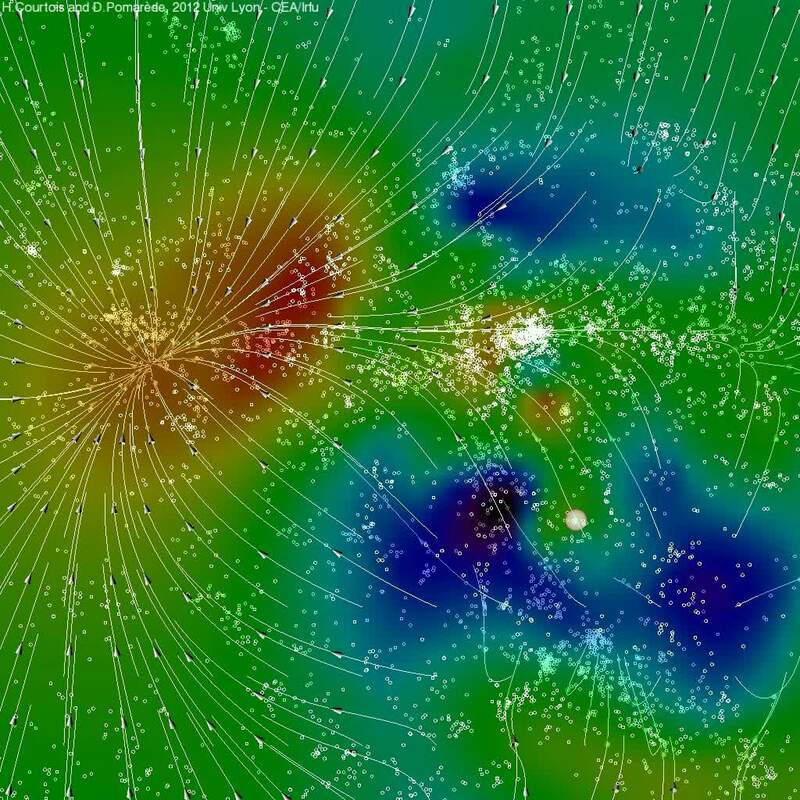 The three-dimensional structure of the local universe may one day become as familiar as our local geography thanks to a new generation of maps that reveal our cosmic neighborhood’s rich complexity and our place within it. It’s well worth the 17 minutes of the movie to feel a little like a cosmic mariner. And in case you wonder how ‘local’ is local? This map encompasses galaxies up to around 300 million light years away from us. One of the key questions that this data can help to answer is whether the distribution of visible mass in the universe is an accurate reflection of the distribution of dark matter. In this movie, the data shows that this is indeed the case. These data were also used to setup initial conditions for the newest CLUES simulations. Sorry, you are not supporting iframe and the page cannot be displayed. Please try one of the links above. 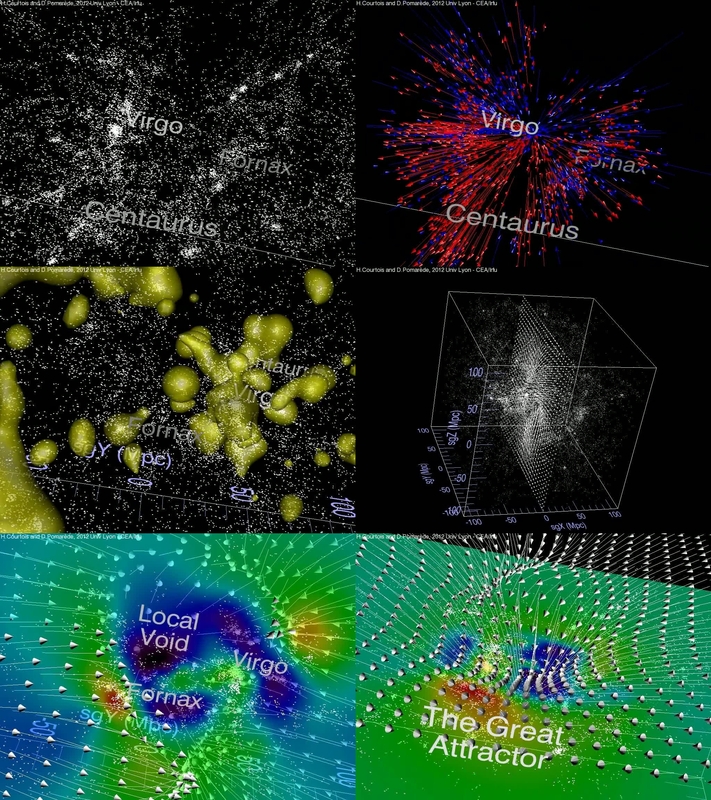 Cosmography of the Local Universe from Daniel Pomarède on Vimeo. a film by Hélène Courtois, Daniel Pomarède, R. Brent Tully, Yehuda Hoffman, and Denis Courtois. All rights reserved. This paper presents an analysis of the local peculiar velocity field based on the Wiener Filter (WF) reconstruction method. We used our currently available catalog of distance measurements containing 1797 galaxies within 3000 km s-1: Cosmicflows-1. 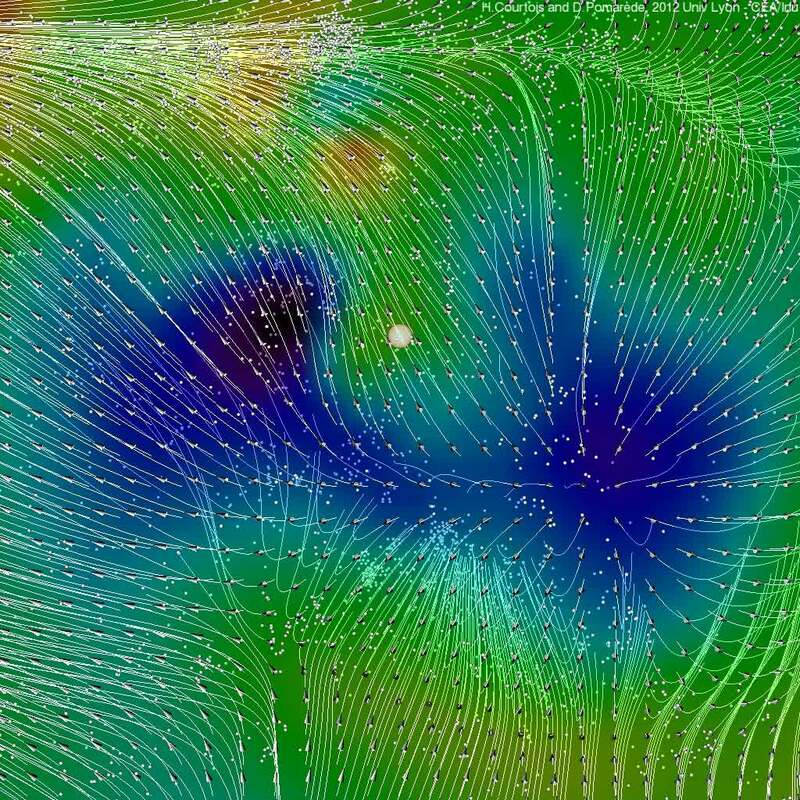 The WF method is used to recover the full three-dimensional peculiar velocity field from the observed map of radial velocities and to recover the underlying linear density field. 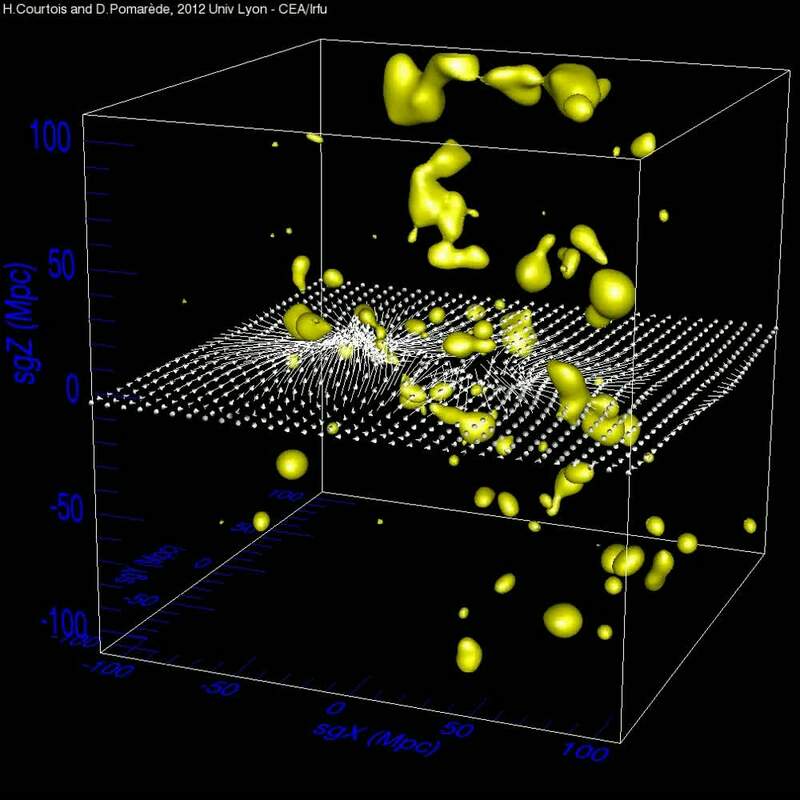 The velocity field within a data zone of 3000 km s-1 is decomposed into a local component that is generated within the data zone and a tidal one that is generated by the mass distribution outside that zone. 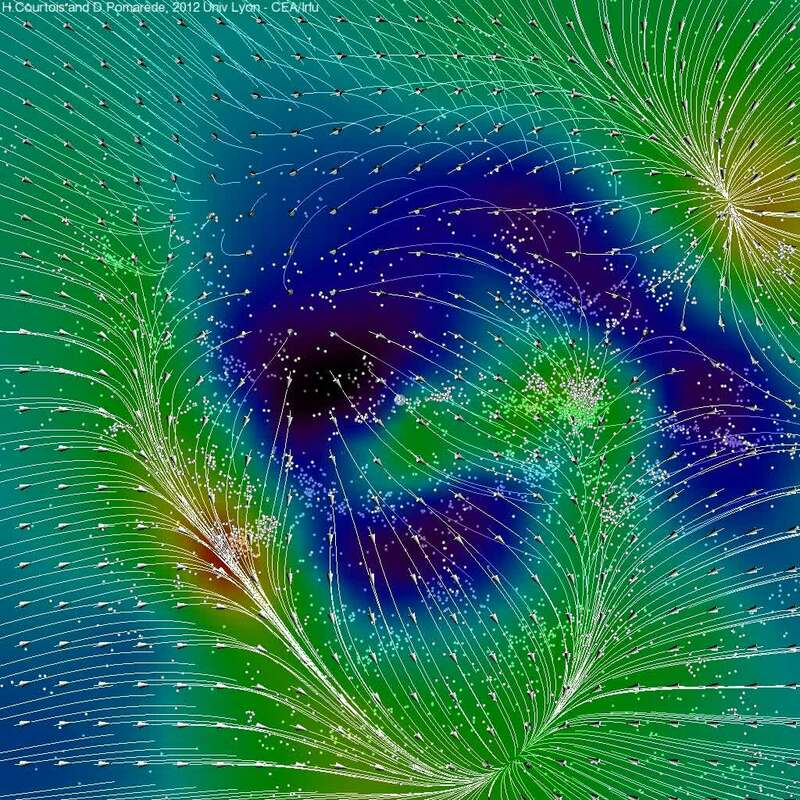 The tidal component is characterized by a coherent flow toward the Norma-Hydra-Centaurus (Great Attractor) region, while the local component is dominated by a flow toward the Virgo Cluster and away from the Local Void. A detailed analysis shows that the local flow is predominantly governed by the Local Void and the Virgo Cluster plays a lesser role. The analysis procedure was tested against a mock catalog. It is demonstrated that the WF accurately recovers the input velocity field of the mock catalog on the scale of the extraction of distances and reasonably recovers the velocity field on significantly larger scales. The Bayesian WF reconstruction is carried out within the ΛCDM WMAP5 framework. The WF reconstruction draws particular attention to the importance of voids in proximity to our neighborhood. 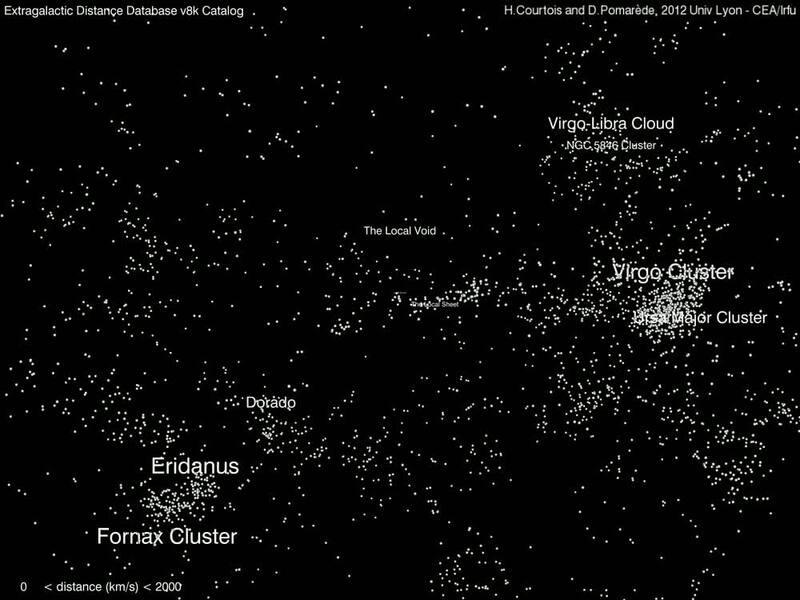 The prominent structure of the Local Supercluster is wrapped in a horseshoe collar of under density with the Local Void as a major component. Some of the resulting movies can be downloaded below. Please be aware that the full resolution files are quite big, so downloading will take some time.